Boat Trailer Accessories | Boat Trailer Bow Stop, for 2” wide Post | VE-VE Inc.
Home :: Boat Trailer Accessories ( #2 ) :: ( #8 ) Bow Stops :: T-992-16; "BOW STOP ROLLER ASSEMBLY." T-992-16; "BOW STOP ROLLER ASSEMBLY." The T-992-16; "BOW STOP ROLLER ASSEMBLY". ( For 2" Wide Winch Post! ). 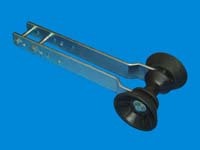 Comes with 3" wide center bow roller with end bell roller caps, mount brackets & fasteners. Mounts on to 2" Sq. & 2" wide x 3" winch post. The mount brackets are made of 1/4" thick x 2" wide x 17" long steel bar stock. There are three different settings from winch post to bow roller, for 2" sq. post, 11", 13-1/2" & 14-1/2". The 2" wide x 3" post settings are 11", 12-1/2" & 13-1/2". Zinc platted finish. Note: Rollers are actually BLUE, not black as shown. "GALVANIZED FINISH", NOW AVAILABLE !! Choose "GALVANIZED FINISH" option below. T-996; Double Roller "Bow Stop"
T-990-16; "BOW STOP ROLLER ASSEMBLY". T-996-16; "Large Bow Stop Assembly"